Google Translate is a cool way to translate any text or webpage into different language in few simple clicks. 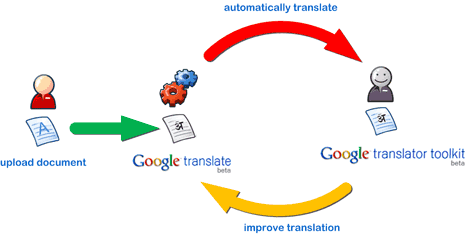 Extending this machine translation coupled with human edit functionality is Google translation toolkit. This new web service allows you to translate text, webpages, knol articles, wikipedia pages and text files on the computer to any languages of your choice. Interface show two windows with left window showing content in original language and right window showing translated text content. After the auto machine translation, you can refine it through manual editing. It automatically shows previous human edits for same text (if available). You can lookup for dictionary meaning of any word and compare text with manual edits with text of original machine translation. Another great idea from Google. There’s a lot of human improvement to do after the automatic engine has finished. Professional translators will gladly use the tool. I’m a translator at OneHourTranslation.com and used to work with translation memory applications (trados etc.). The main advantage Google brings is the collaboration option – few translators working on the same draft.